After assessing the races for both supporting actress in a drama and comedy series, we now move on to the guys and predict one of this year’s toughest acting categories. This year, once again, is no exception as there is no sure contender to win this one. Let’s now go over their chances one by one. Despite the Homeland shutout, Mandy Patinkin manages to stay for another season of a nomination. This year, he submitted “Gerontion”, it showed two sides of Saul: the first one as the fierce competent team player of the CIA and the other as a devoted husband to his wife. Patinkin’s tape, while totally not a showstopper, is really good, but in a competitive race like this, tape alone won’t bring you any close to a win. After all, it seems like he’s not much of an Emmy darling lately missing a nod for the show’s first season and losing last year when he’s a frontrunner. This year, I think his nomination is his reward. Doing a comeback after his first and only nod three years ago, Josh Charles final season on The Good Wife is one of the most buzzed characters of the past TV season. That said, he avoided that storyline altogether and submitted what is considered as the best episode the show has ever done. In Hitting the Fan, Will discovered that Alicia and Cary are starting their own firm and taking away some of their big clients which caused ruckus in the whole office. While most episodes usually end up with something shocking in their submissions, Charles does the opposite by starting it with one. Literally, the first dozen minutes or so of the episode is a highlight for him, and I think this will appeal well to the voters. Downton Abbey continues to show its strength to its voters via Jim Carter‘s third consecutive nomination. And while the last two years haven’t been really competitive for him, this year marked his first real great submission via Episode 1 of the fourth season. In this almost two hour episode, we see him deal with a significant person from his past, his former song-and dance partner Mr. Grick, whom he had a falling out with. And in true old movie film fashion, the reason for such was a love triangle. Of course, things were patched up in the end via an emotional trains station meet up. I’m inclined to think that in a weaker year, Carter would have stood a chance of even winning for this stuff. Unfortunately for him, this is one of the most competitive ones in recent years, and while I don’t dismiss his chances altogether, he’s lurking on the outside in terms of Emmy talk. Winning the Golden Globe earlier this year is Ray Donovan‘s Jon Voight. With the chance of him earning his first Emmy, he submits Fite Nite which had him in most of the episode in cuffs. This is an intense episode where both he and guest star Rossana Arquette were tied and a hitman deciding their fate. This ends up with a death of a character and the revelations before that mentioned death, and Voight goes on a gamut of emotions in it. There’s also a certain level of physicality in lay as he’s being tied in the most crucial scenes of the episode. While Ray Donovan clearly wasn’t embraced by Emmys, his status as a Hollywood veteran might make up for that. 2011 champ Peter Dinklage aims to win his second Emmy for his role as Tyrion Lannister after winning for the show’s first season. In one of the most acclaimed episodes of the season, he chose the to submit The Laws of God and Men which had his trial after being accused as responsible for the death of King Joffrey in the prior episode. Nothing says Emmy bait like a trial, and here, Dinklage was indeed exceptional. He goes on a speech before the episode ends especially after his lover was used as a witness against him. That said, his first appearance comes within the last 20 minutes of the episode and that’s too much for voters with short patience. Lastly, aiming to be the most rewarded actor in the history of this category, Aaron Paul is in hunt for a historic third win here for Breaking Bad. And he’s surely in the hunt again with his episode submission Confessions. After being grilled by hank about his involvement in all the drug trafficking in their place, Saul bailed him and gave him a new identity. But this did not sit well with him, as he ran amok and attacked him before going to Walt’s house. Talk about intense, the last 10 minutes of the episode is acting with a capital A for Aaron who’s loud and showy acting is really present. This can go well or not with the voters, and while no other actor has won twice before, it was Paul who managed to defeat the no repeat winner record in this category for 15 years. So if there’s one who can break another record, it’s probably him. Like what I said, this is really a difficult category as a lot of these actors make sense and all of them would have been frontrunners or automatic winners in any other year. While I won’t be surprised if Dinklage wins, I’m putting him at fourth here. I think his tape is great, but the lack of appearance during half of the tape will affect him. I’m putting Voight at third because it’s a very Emmy thing to reward him in a crowd like this. Plus, the reasons I mentioned above. I think it’s a choice between Charles and Paul and while both of them are on their last possible nominations for their respective roles, 2 Emmy wins for Paul in the past as compared to none for Charles will seal the deal here. 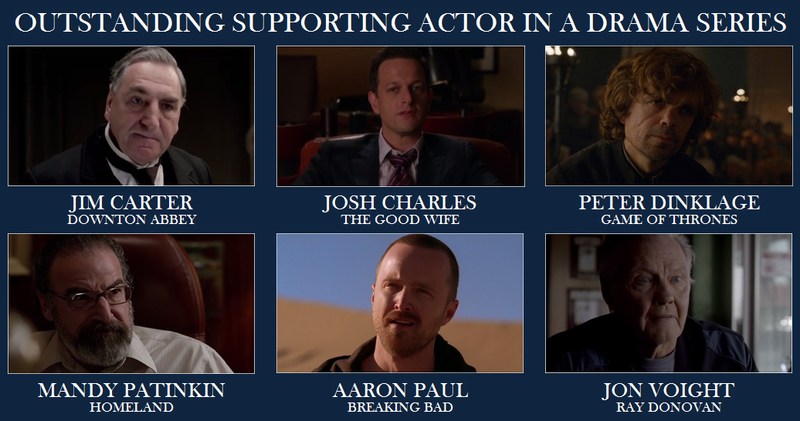 Thus, I’m going with Josh Charles for the win. Now off to the supporting female counterparts, let’s shift the moment on to the men’s side. Last year, Aaron Paul made history by being the first supporting actor who won a second Emmy in this category in fourteen years. This year, he can continue to beat his own record by winning a third one. Let’s see his possible competition. Jim Carter surprisingly received another nomination for his work in Downton Abbey. Though the love for his show has somewhat cooled down, it still has fire enough in it to pull off some major wins. With that said, it is good on his part to submit he first episode of the third season which runs for almost two episodes already. 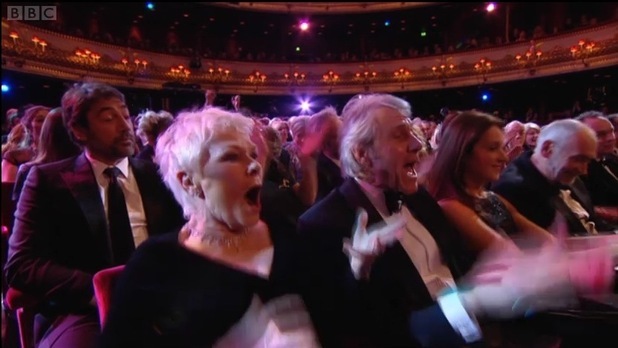 But with that said, I guess the best part of his nomination this year is that he and his wife Imelda Staunton (nominated for Supporting Actress in a Movie or Miniseries) are both nominated. 2011 winner in this category Peter Dinklage received his third straight nomination for Game of Thrones. It is luck for his part that he won on the season with no Breaking Bad, as he competed in a weaker competition that year. Otherwise, I think he might have joined the ranks of other consistent but no Emmy win nominated guys such as Mad Men’s John Slattery. While he submitted Second Sons as his episode submission, I think there are far and away more frontrunners for him to scoop a second Emmy win. 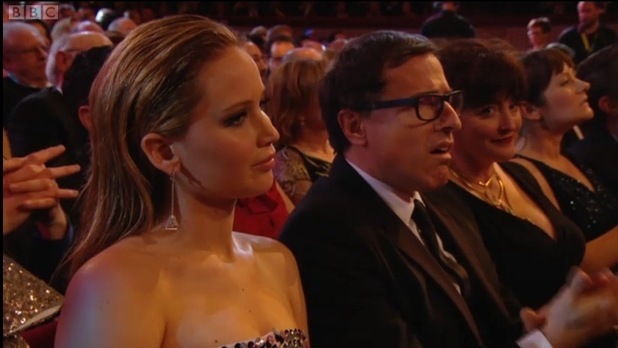 Last year, Claire Danes invented a funny catchphrase when she mentioned in her speech “MANDY.PATINKIN. Holllaaa!” The same can be said now in this category, as Mandy Patinkin finally gets an overdue nomination for Homeland. This year, he made a terrific submission by going with The Choice, which is the show’s season finale. Add the fact that he is an Emmy veteran with previous wins and is nominated for what is Emmy’s most recent drama champ, and then it’s safe to say he’s in contention this year. 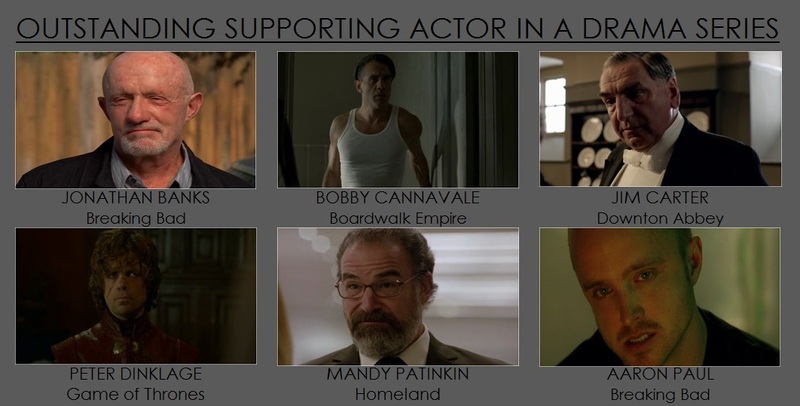 Two time nominee this year is Bobby Cannvale for his work in Nurse Jackie and Boardwalk Empire. Cannavale is one of those subtle favorites of the Emmys. He won one before for his Will & Grace stint, and he continues to rake in nods years after. It is surprising to note that he is the first Boardwalk actor to get nominated in this category, so that might factor in. He only has almost ten minutes of screentime in his submission Sunday Best, but each of his scenes leaves enough impact. His is the tape that does not need enough screentime, as he owns it every time he appears. Sadly though, the Academy has quite moved on from the show, so that can affect his chances. 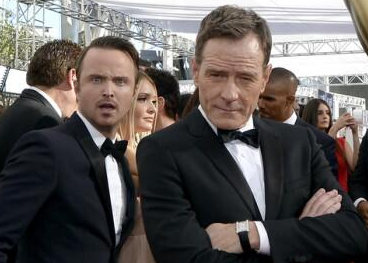 … it’s Aaron Paul he’s contending with. The same narrative could have propelled Giancarlo Esposito for the win last year, but they decided to give Paul a second win instead. Not that he deserves it since he has a winning tape last year, but the past season of Breaking Bad is definitely one (if not THE) weakest season of Paul in the show. It also didn’t help Banks that Paul submitted Buyout instead. Let’s see if Paul wins a third one or they reserve it for next year. In my opinion, the consensus in this race is now between Mandy Patinkin who s a respected veteran in a competitive role vs. Aaron Paul who, as proven last year, is loved by the Emmys in his own way. Between the two, I’d give the advantage over at Patinkin. With that said, I think I’m quite going crazy but I guess I have to go with Bobby Cannavale for a surprise win. I really can’t put a solid argument why (that’s why maybe he’ll lose), but I can sense his tape will lead some votes on his way. I’m actually surprised how strong Jim Carter‘s tape is. He has tons of screentime, and he has a story running throughout the episode. He was showy as one can get for a supporting role, and having two tapes certainly increases his chance. However, the main problem I have with both Downton actors is that when you compare their episodes alongside the four nominated actors, it lacked the certain emotional gravitas that will make you rank them on top of your ballot. 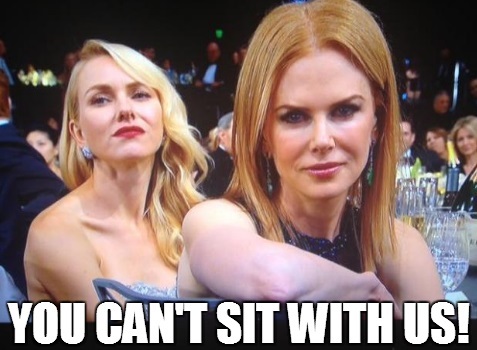 That’s what Carter needs to overcome in terms of his Emmy chances. If Carter is the showier Downton actor, co-star Brendan Coyle relies on poignant, quiet moments in his episode. One can argue that despite not having a huge amount of screentime, all hisc scenes with Joanne Froggatt in his episode really stands out on its own. However, not even an additional episode care of co-nominee Carter can increase his chances of passing all the other men to receive the Emmy next month. He’s a perfect example of getting nominated is the reward already. Current title holder Peter Dinklage submits Blackwater where in he has that inspirational speech in the middle of the action-packed episode. This is an improvement over his supposed previous submission; however is this enough for him to retain the title? I don’t think so. First, he submitted the most buzzed episode of the season again, and I don’t blame him for that after Baelor did give him his much deserved Emmy last year. But for some reason, Blackwater wasn’t received by the Emmys the same way Baelor did. Plus, this category is stronger this year than last year, so voters might spread the wealth. Giancarlo Esposito plays the best villain on TV right now, and it’s good that he gets nominated this season. He also benefits from the fact that the last few minutes of his submitted episode really leaves an impact to the watchers. Paul’s tape does not give him that much of a showcase, though it is safe to say that his presence was felt in the other episode as well. If fans of the show want to spread the wealth, they might opt to go with Esposito as their personal choice for the win this year. I also think he is the most buzzed nominee in this category which also helps his chances. Perennial nominee John Slattery skipped a nod this year, and the Mad Men actor who replaced him is none other than Jared Harris. His tape revolves around a life changing situation that ends with a very baity scene. He portrayed depression intricately and his submitted episode ends with a resolution. Harris has been a consistent player in Mad Men for years, and if Mad Men finally gets an acting win at the Emmys, I won’t be surprised if Harris is the one where they’ll reward with the trophy. 2010 winner Aaron Paul comes back after a season of ineligibility, and his chosen episode is very competitive to say the least. The difference between his and co-star Esposito’s tapes is that while Esposito’s tape leaves you with an impact after seeing it, Paul’s acting is the one responsible for the impact that his submission gives you. His moment in the middle of the episode with Cranston is every inch intense, riveting, and on spot great acting. However, if voters are not fan of in your face acting style, I can see them resorting to other nominees. However, between him and Dinklage, he’s the likelier to repeat a win. It is noteworthy to see that there have been no repeat winners in this category for sixteen years now, and while that seems more of a coincidence than a trend, it is difficult to dismiss it as such. With that said, I’m leaning to an Esposito vs Harris among the newbies with Paul as a likely spoiler to siphon votes between the two. This is a nailbiter until the envelope will be opened come Emmy night.